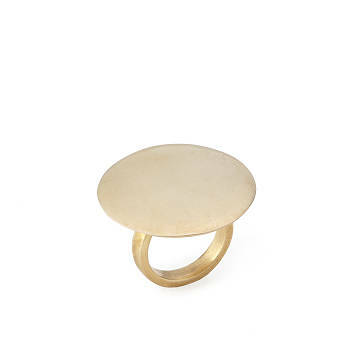 This minimalist, recycled brass take on the classic medallion ring helps its Kenyan maker earn a living. How do you make a classic style edgy? You could play with size, or erase details. Kenyan artisans did both to re-cast the traditional medallion ring as striking statement jewelry. The enlarged, minimalist disk, a playful homage to the traditional version, is hand-crafted from recycled brass using traditional tools and techniques. Working with Nairobi-based fellow B Corp Soko has plugged these women into the world market. They've been able to increase sales and raise their incomes while working close to home and taking care of their families. It’s a shining example of win-win. Handmade in Kenya.